30 days of Roc, where we release 1 new instrument a day! You're on day 19 We're also running a contest for each instrument, where you can win $10-$50 iTunes gift cards! 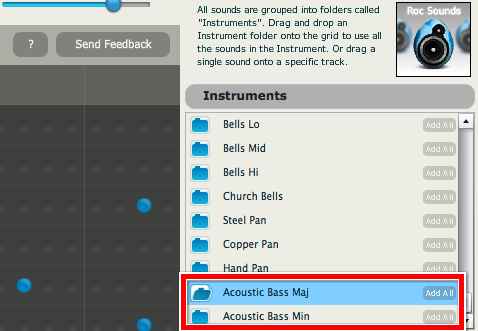 Today we're releasing both "Acoustic Bass Minor" and "Acoustic Bass Major". You can find them both in the instruments toolbar, located on the righthand side of Roc, our music creator. With both instrument packs, you'll have the combination of 24 new bass tones to work with. Feeling a little....ambitious? Give our demo song a listen and see if you can make theimpossible, possible. Hint for Day 20 release (coming Wednesday, man, we're 2/3 of the way there! ) : Who the heck needs frets?? Get alerts for when a new instrument pack becomes available! Subscribe to our blog through an RSS feed, or get it straight to your email to never miss a thing.